Right after we wrapped up New York fashion week, or wait, in the very middle of it, we had to skip a few shows as we were invited to attend a very exciting and special event in Milan. Direction Europe a few days, earlier than expected! Even though I missed a lot of the shows from brands I absolutely loved, it was a good occasion to wind down a bit before madness began again. As soon as we set our feet on the plane, the only thing I could think about was wearing a large fluffy sweater, no make-up and flats. And well… The moment I opened my hotel room door in Milan, it was all about ordering tea, taking a really long nap and pampering. As much as fashion month is so insanely amazing and fun, it is also very intense, terribly stressful at times and challenging in terms of work effort and efficiency. We all want to make the best out of our days, attend most of the shows possible and well… Look amazing while doing it. On days when I really feel like it, it occurs that I change up to 4 times a day : meaning better try to stay organized. On other days, I drink a lot of espressos and force myself to pull out at least two, one for the day, one for the night. Seeing all the new collections is such a wonderful adventure and I am so happy that this year you can see most of it with me thanks to Snapchat! So while in Milan I had the pleasure to take a bit care of myself before leaving to London. My goal was to detoxify as much as I could and keep my skin as clean and healthy as possible. Whether I want it or not, fashion month sort of means wearing a lot of make-up everyday because of pictures being constantly taken and therefore the skin suffers quite terribly… Travelling, lack of sleep, stress and on top of that layers of make-up. Not the best to maintain a healthy complexion. I make sure that the products I bring with me while I travel are the best I can get, less is more. My number one tip is to really make sure to take all your make-up off before going to sleep, and it is so very tempting to just fall on your bed as soon as you come back from a party like a potato and not move anywhere, not even to your bathroom but believe me, your skin will be so thankful that you let it breath even if it was just for a few hours. It also allows you to refresh it and let it naturally rejuvenate. 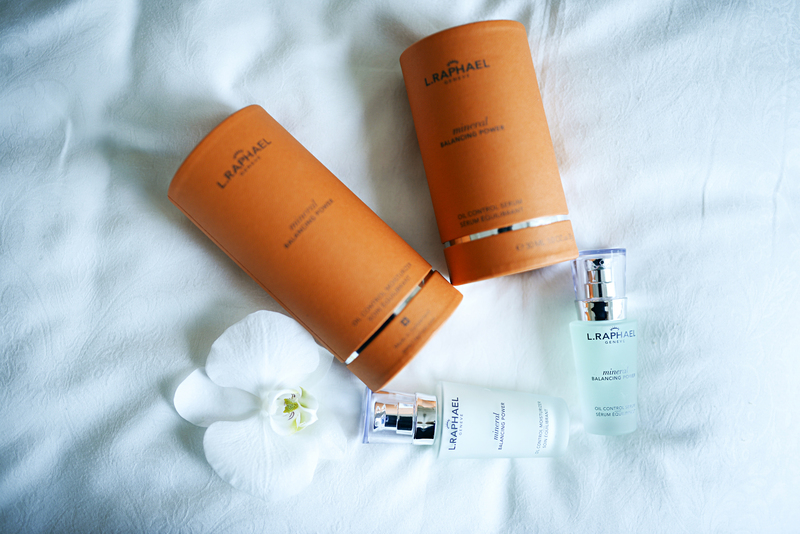 On the other hand, I bring a lot of natural products and some from one of my favorite swiss skin care brands L. Raphael. As I come from Switzerland, I truly value and appreciate the quality of our niche and luxurious skin care lines, the effects on the skin’s health are mental. I’ve been using L. Raphael for ages now and have to say am so impress by the incredible quality of each product. I tend to break out a lot because of the constant climate change and so the Mineral Balancing Power serum and cream have been my absolute favorite items as it prevents my skin from imperfections. 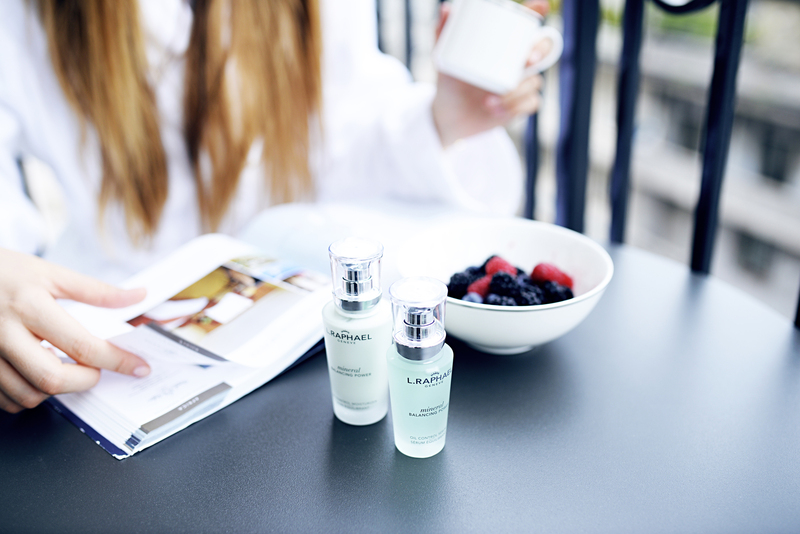 Of course, I would also recommend getting as much sleep as possible, drink a lot of water, avoir alcohol or sugar and stay as happy and positif as possible as this also, must definitely affects the perkiness of the skin! Guys, I highly encourage you to discover L.Raphael if you don’t know if yet, it is beyond spectacular. You will love it. The prices can do quite high but trust me, less is more like we said but you’ll see, you’ll need much less foundation once my skin is flawless. I hope you guys enjoyed these few little tips. Back! I din't know this brand but I'll buy and I'll prove. Love watching your journey through fashion month! I'm sure it must be so difficult to keep your skin healthy during all of the madness! I love your blog because you actually take the time to write. Your skin looks amazing, thanks for sharing your tips! I've been looking for more skin products. Fashion week sounds so stressful, yet I would really like to go someday. You look gorgeous here too, btw! Your skin is so pretty. It looks like the pampering did you well. It must have been nice to take a step during fashion week, event though missed out on some of your favourite designer. But we all need to take a break at some point, right? You always look flawless even when pampering! Love it!! The post you make about the different detox program as foodie and beauty, I find really useful and long expected. As for me, a person who loves eating different yummy things, drinking coffee, working all day all night, detox programs are a sip of fresh air! And I definitely need to make one in the nearest fur=ture, cause my body, skin and mood started giving up. 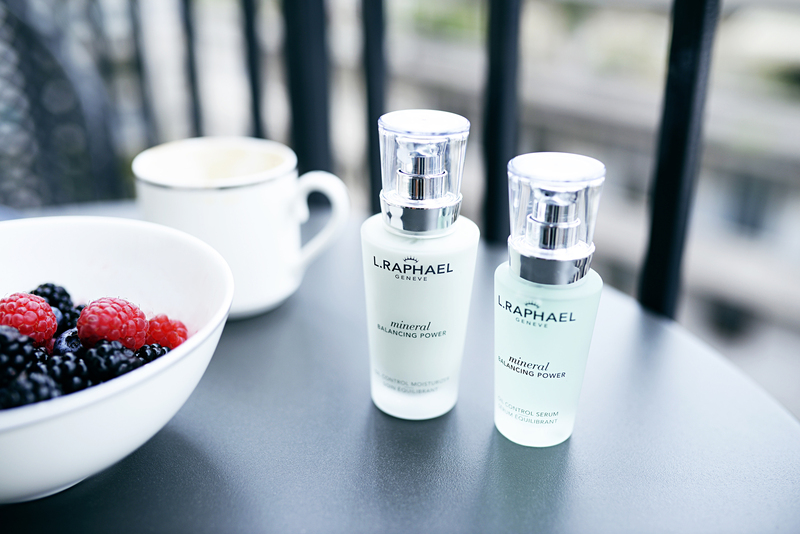 L.Raphael sounds like a fantastic skincare brand, thanks for the recommendation! And sounds like a busy fashion week with endless number of activities, do take care! Nearly CHF 200.- for a moisturizer is ridiculous. But you still amazing, Kristina! :) I agree, thoroughly removing makeup before bed is truly essential, and your skin will thank you so much later! Will definitely have to try out this skincare. Your skin looks amazing! Beautiful photography, really helpful post! Your skin is insanely flawless.. Just gorgeous. P.s. it's nice to read you have days you'd like to crawl up in a sweater without any make up on ! hey K ! I really adore your blog and your beautiful photos! Great advice Kristina, I wish there was a wider range of natural products in America that didn't have as many harsh chemicals. Thank you for the recommendation! I feel like a good collaboration for you would be to have your own natural, affordable skin cleansing line. I would buy it! Thanks for the tips Kristina! I will report them to my gf! I like your blog because you actually take the time out to write. I'll definitely have to try out that skin care brand :) Thanks for the tip! I wish you could smell things through the internet! you're so fresh and beautiful, Kristina! Thank you for sharing your beauty tips, I always discover new brands that are off the radar but are so great!! wow...it does sound stressful , but these images are so amazing and you looks so relaxed and lovely! I can't imagine how stressful these fashionweeks must be! Already looking forward to PFW though, because I live in Paris at the moment. A meet-up would be so nice! You look stunning Kristina! I'm looking for some new product for my skin and I will check them out! Stunning! Your skin is flawless. I ALWAYS remove my make up before I go to sleep! If I don't do this, I just can't sleep in peace! I'm trying to keep my face save!!! I'll check out the products of L.Raphael! Great photos, Cibelle is taking better pictures everytime she photographs you! Adore these pictures, so cool! You look flawless! No signs of fashionweek madness in these pictures! how do you always look so flawless! I totally agree with yur tips! I also think that organic skincare is essential to not burden the skin in addition to everyday chemicals and so ... The natural way is always best! To be honest, I have never heard of this brand but I will definitely check it out. Great pics! I know this post is about detoxing and letting your skin breathe but I have to ask, what foundation are you wearing in these pictures? It's amazing and your skin looks flawless. I'd love if you could do a make-up tutorial sometime? Switzerland has great cosmetic laboratories. I used the Oil Mineral Balancing Power... and love it! One of the values I take account of this brand is undoubtedly its quality. Congratulations, I am a public person. I recommend your blog. You are so perfect, Kristina! Such a beautiful and talented woman! Your skin looks absolutely flawless despite all the non-stop traveling! It's so important to take the time and effort to maintain it - thank you for sharing all your tips! This is a wonderfully written article that all those attending the shows should read. It's easy to get a bit overwhelmed with all the chaos. i especially liked your advice about never going to sleep with your makeup still on. That's a very bad idea. I enjoy your website blog and your writing very much! I love quiet moments like this. It's so important to take them & self indulge with a little pampering. I've not heard of this brand before, so I'm off to check them out a little more. Thanks for sharing and fot the tips! I will give a try. So sad that when you finally post it's an advertisment. I miss the old and regular outfit posts and get really tired of this product placement. Please take this comment into consideration. Beautiful post! So calm and relaxing. I love this look. You look gorgeous!! Great detox tips! Never heard of these products, but they look amazing! Great tips, love the pictures! I'm so glad you got a chance to relax even if it's just for a while, Kristina! I know how hard you and the Kayteam work so it's nice to see y'all relax too! Definitely true! I can recount one or two occasions when I’ve just collapsed onto my bed – and regretted it in the morning. Great post and can’t wait to read about your views on Milan Fashion Week! Absolutely stunning. You have a great skin!! All I can say is WOW she's a glamphrodisiac!! Removing your makeup properly is probably the single most important thing to consider in detox process. Thanks for the detailed post about this important issue.